Watch the ads from Denny Manufacturing…the world’s largest manufacturer of hanging backgrounds and you will see a new emphasis on hand painted classic canvas backgrounds. The more formal classic style of doing photography with the traditional classic background is coming back. Actually it never left. Candid location shots are good but when the customer needs a really good personal portrait, you can’t beat the classic canvas look. If you had a projected virtual background system, you could have dozens or even hundreds of classic backgrounds in your system instead of buying individual backgrounds that have to each be hung and then stored and it can take minutes or longer to switch backgrounds. The simple way is to just project them with a virtual background system. Call your virtual backgrounds representative for more information. A NO COST PUBLICATION THAT YOU CAN DOWNLOAD FOR FREE. ﻿ What is that option? It is so basic that many of today’s struggling photographers have missed it entirely. It is a fundamental principle of any business…always has been…always will…and that is concentrating on providing your customer base with a totally different experience and a wide variety of end product. It is NOT just being a better photographer. Being better is important but being better is so subjective. But when you offer a completely different experience and product mix, then that is something you can “blow your horn” about. BUC-EE'S, the ultimate super size convenience store now spreading across Texas. There are thousands of convenience stores but only one BUC-EE'S. ​Having an official studio, even if it is in your home and using Virtual projected backgrounds can play a major role in making you different Amateurs and most other professionals don’t have projected background technology. Offering economic video production services. The key is to provide services and product others do not do. IF YOU WANT TO CHALLENGE THIS THINKING AND HAVE A BETTER SOLUTION, PLEASE SHARE IT WITH US. IS REALLY EXPENSIVE - HOW CAN IT BE A GOOD INVESTMENT? ﻿A good investment is one that relatively quickly brings in enough revenue to pay for itself and then go on paying for itself again and again. This is fundamental to any investment. Some photographers have paid for their system within a few weeks primarily by using it to get business they might not have gotten without it and by using it to increase average sales by enticing customers to spend more. It’s that simple. ﻿Virtual projected backgrounds has always been a concept that has mystified many photographers…causing them to be almost paranoid in their thinking that the concept just could not possibly be as powerful as claimed. But, the fact is, the virtual background process is more important today than it ever has been in the past as photographers struggle to find ways to provide the public with photographs they cannot possibly do themselves. Faith is not an issue since photographers can see, touch, and try the process for themselves. They can learn about the results other professionals have achieved by using the virtual background process as a distinguishing feature. They can read books such as Background Power! And How To Make Money With Virtual Backgrounds. They can view hundreds of sample images. The key factor necessary to achieve success is the desire to produce products that are clearly different. The two primary ingredients is to have a space outfitted as a studio using professional lighting and having a background system. It is the background system that capitulates the studio from one with one or several backgrounds to one that has a world of backgrounds and the ability to customize backgrounds to enhance each individual client. The limits are primarily set by the operator. "OUR OBJECTIVE IS TO CREATE PORTRAITS THAT NO ONE ELSE CAN DO. PORTRAITS THAT EVEN I COULD NOT DO WITHOUT MY VIRTUAL PROJECTED BACKGROUND SYSTEM AND QUALITY STUDIO LIGHTING. I RUN A FULL TIME STUDIO." If you need help, just call. Don't let a virtual background system set in the corner. ﻿Besides coming to the Virtual Backgrounds headquarters in San Marcos, TX you can visit Cindy Cofer Barclay in Louisville, KY or Pete Budraitis in Long Island, NY. Both Cindy and Pete have agreed to make their studios demonstration centers of virtual backgrounds. Just call and make an appointment. "There is nothing in this world that someone cannot make a little cheaper and those who only look at price alone are their lawful prey"
Manuel has created a thriving business by concentrating on being dramatically different in the portrait, youth sports and photo booth markets. He is a full time photographer with a storefront professional studio. He reaches out to bring business to his studio OR he takes his “studio” to the event location. Rather than being like every other photographer, he makes his case for being different and gets the jobs even though he is not the least expensive photographer in town. He was an early adopter of digital and invested in having a storefront studio when most photographers abandoned their studio in favor of shooting snapshots on location. He discovered the Scene Machine virtual projected background system at WPPI and as soon as it became fully digital, he immediately invested. His use of the Scene Machine is now fundamental to his growth and success. No one who competes with him in his market has anything like it. “I have a big advantage over other bidders for the sports events because I can do pictures indoors with quality lighting and any imaginable background created with my Scene Machine. I am also doing a lot of dance schools…again with special backgrounds with my Scene Machine." "I use props with my photo booth pictures and in the studio. Everywhere I go I steal the show…the people think it is the coolest thing going. I just flip my finger across the screen to change backgrounds. It’s just cool and it amazes people so much that when I do a job, I get calls from people who saw me and want me to do their event or team. We are making money baby! Being clearly different in what we offer makes the difference." 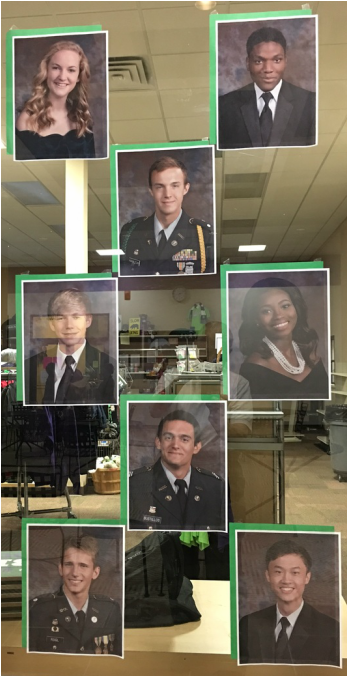 At the San Marcos Academy, senior portraits are all posted on the bookstore windows. Notice the traditional classic look. It’s a quality style that presents a timeless image rather than a bunch of snap shots taken around town. When applying for college, graduate school or for a job, the timeless classic look best serves the need. Candid shots around town are fine but not when you need to display your professional look. The classic portrait should be part of most every sitting and what’s best, amateurs cannot create it…they don’t know how and they don’t have the equipment. 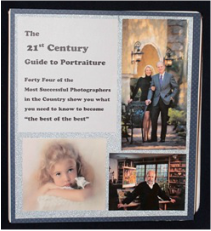 The classic portrait clearly projects the client’s professional look. "If a photographer does nothing really special, then why should they get hired unless they are the cheapest? If the photographer can do something really special like using projected virtual backgrounds with all the advantages that it brings, then this catches the attention of the decision makers and brings jobs and profits"